The open top lift-off trash receptacles are ideal for offices, airports, hotels, and are available in an assortment of colors suitable for any decor. The tops lift off for easy emptying. 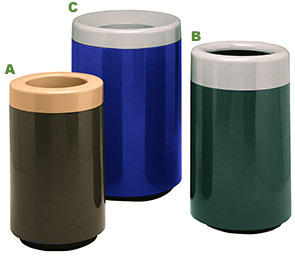 These trash receptacles are made with a smooth seamless fiberglass construction and a scratch-resistant, UV stabilized finish to resist fading and will not stain or tarnish. One inch recessed base prevents scuffing from traffic. The open top lift-off feature makes maintenance a breeze and folding retainer band keeps can liners in place. Available in 18, 27 and 60 gallon capacities.